Robert Sheehan is to leave E4 drama series, ‘Misfits’. The Portlaoise born actor has announced his departure which will allow him to concentrate on his feature film work. His character, Nathan is to be replaced by a new character called Rudy who will be introduced in a special online short on the Misfits website. Robert is currently shooting the second series of ‘Love/Hate’ and is in pre-production with new feature, ‘Romeo and Britney’. Sheehan has been involved with ‘Misfits’ since the start of the show. The second series of the supernatural show brought in approximately 1.5million viewers last year. The third instalment of the series is scheduled to return to E4 in November pre-empted by an online short based in Las Vegas where Nathan will officially exit the series and new character, Rudy will be introduced. 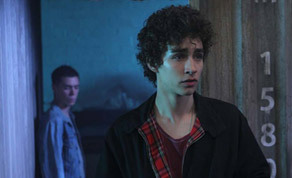 The show’s executive producer, Petra Fried (Afterlife) commented on Robert’s departure, saying: "We are all sad to say goodbye to Robbie Sheehan – he has been brilliant as Nathan. Luckily for us, all of Nathan’s filthy lines were written by (creator and writer) Howard Overman, and there’s loads more where they came from – we call it the Overman dirt bank." The upcoming ‘Misfits’ series will start shooting at the end of this month during which time Robert will be busy on the set of the second series of Dublin crime drama ‘Love/ Hate’. Following this the Portlaoise man will travel back to London in June to shoot new David Baddiel comedy feature, ‘Romeo and Britney’ with ‘Dr Who’ star, Karen Gillen. The 23 year old is also attached to several project currently in development – chief amongst these is B Good Picture Company’s ‘Acts of God’ and World War Two drama, ‘Wayfaring Strangers’ which is an Irish-French co-production from Treasure Entertainment and Chic Films currently in the pipeline.